From aerospace engineering to control systems and everything in between, our Engineering & Modeling track will provide the hands-on workshops, expert presentations and cross-industry networking you need to apply hybrid symbolic-numeric computation, machine learning, advanced visualizations and automated algorithm selection to your engineering workflows. Learn best practices and the newest ways to test ideas and design efficient and reliable solutions. Acquire new skills or build on existing ones with our pre-conference training classes. 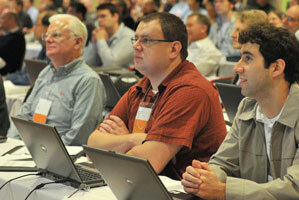 Experience a full schedule of workshops and presentations given by Wolfram developers and fellow attendees. These talks will cover a wide range of relevant topics and hands-on techniques. Connect. Brainstorm. Solve problems. Meet. Learn. Inspire. The Wolfram Technology Conference offers a variety of networking opportunities through coffee breaks, roundtables, meet-ups and special functions. Note: you must bring your own laptop for these training sessions. Training sessions are offered on October 16 at two times, 8am–noon and 12:30–4:30pm. The Wolfram Language and Mathematica have been employed by scientists for over 30 years as a "Swiss Army Knife" of scientific computing. This class will cover uses especially relevant to physicists, engineers and scientists, from basic architecture to the most recent and advanced features. Among other subjects, we will stress symbolic and numeric functionality, automated physical data access, visualizations, working with geometry, regions and meshes and solving differential equations. This new course follows an example-driven format to illustrate and explain basic concepts and methodologies in contemporary image processing. Topics include operations for brightness and color, controlling contrast, histogram manipulation, thresholding, color, image segmentation, geometric operations and image enhancement. Additional advanced topics will be explored during the class according to interest, with course notebooks provided for further study. Build your data science process around insightful questions rather than limited traditional methods. This class utilizes a flexible and integrated workflow and teaches you how to work with data in various formats, wrangle real-world messy data into clean computable datasets and perform preliminary explorations. Notebooks from the latest Wolfram U data science course will be provided for further study. Incorporate automated machine learning into your data science analysis and modeling process and share your insights. Complete the data science workflow with tools for visualizing, reporting and publishing the results of your analysis. Notebooks from the latest Wolfram U data science course will be provided for further study. 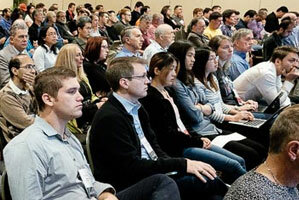 Interested in sponsoring the Wolfram Technology Conference?